Monday June 27th 1921 A very warm day. Laura up town to do some final shopping. Vene & Edith washing. I did a little tatting. Read the papers and slept part of afternoon. My eyes feel better. Tuesday June 28th 1921 Laura finished her packing and left for [Castro?] Beach at 10.45. Edith and Mrs Rease going that far with her. I spent a restful day. Letters from the folks say they had to stay at Bloomington all night it rained so hard and reached Galesburg at 6.30 last night. Edith home at 6.30. Wednesday June 29th 1921 A warm day. Vene and Edith busy with ironing and fruit. I made some tatting. Slept in afternoon. Evening on porch. Thursday June 30th 1921 It is 13 years today since Rob & Cora were married. I had a letter from Hattie. They got home Tuesday evening. I wrote Laura, Ida, Hattie & Lizzie Lindley. a card from her. 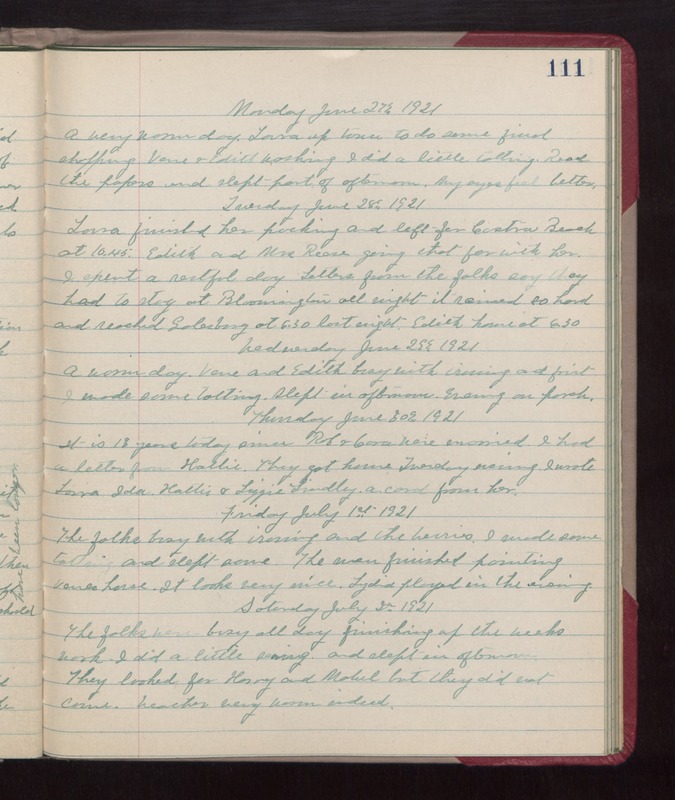 Friday July 1st 1921 The folks busy with ironing and the berries. I made some tatting and slept some. The man finished painting Venes house. It looks very nice. Lydia played in the evening. Saturday July 2nd 1921 The folks were busy all day finishing up the weeks work. I did a little sewing and slept in afternoon. The looked for Harry and Mabel but they did not come. weather very warm indeed.